We call our dried salmon 'Be’h'. This is a very traditional way of preparation that our mother Rita George taught all of my brothers and sisters. It is the way our people have preserved our salmon for generations. The process isn't necessarily easy, but certainly worth it. Whole wild pacific salmon (ideally sockeye), 7-10 lbs. Heads on and cleaned. Working from the inside of the fish, starting at the head, cut along the back bone with a sharp knife. Follow the back bone to the tail. Repeat process on other side. To cut strips: Use a sharp knife to cut the fish at an angle ensuring not to cut all the way through the salmon. Leave about a 1/4 to 1/8 inch of flesh on the skin. 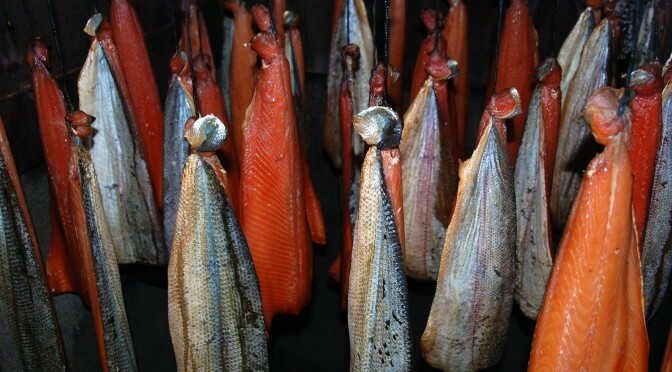 Return salmon to racks in smoke house (cold smoke only) for an additional 24 hours for half dried, and 48 hours for fully dried salmon.